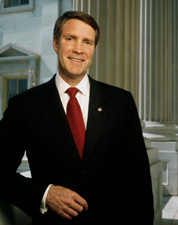 FRIST, William H., a Senator from Tennessee; born in Nashville, Davidson County, Tenn., on February 22, 1952; attended public and private schools in Nashville; graduated from Princeton University 1974; graduated from Harvard Medical School 1978; worked as a heart and lung transplant surgeon; director, heart and lung transplantation program, Vanderbilt University Medical Center; author; elected as a Republican to the United States Senate in 1994; reelected in 2000, and served from January 3, 1995, to January 3, 2007; chairman, National Republican Senatorial Committee (2001-2003); majority leader (2003-2007); not a candidate for reelection in 2006. Frist, William H. Tennessee Senators, 1911-2001: Portraits of Leadership in a Century of Change. Lanham, Md. : Madison Books, 1999; Frist, William H. When Every Moment Counts: What You Need To Know About Bioterrorism From the Senates Only Doctor. Lanham, Md: Rowman and Littlefield Publishers Inc., 2002.